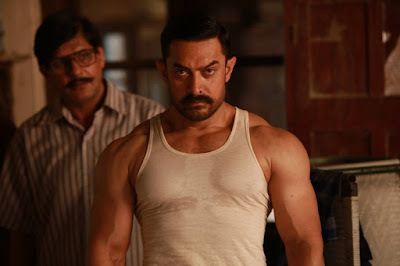 Dangal 6th Day Collection: Dangal film is doing stupendous business at the domestic box office as well as overseas market.At the international box office it had collected an awesome amount till today. The total overseas market box office collections of the film after a four-day run stand at a whopping Rs 76.16 Cr. The movie has done an awesome box office busies in domestic market and in its first weekend, the film grossed an impressive Rs 106.95 crore, according to trade analyst Taran Adarsh. Dangal movie has received so much love from audiences and they are giving good positive reviews. Film’s lead star, Aamir Khan, was tweeted and thank the audience. As the film crossed the Rs 200-crore mark worldwide, the actor tweeted, “Thank you for all the love and warmth, and thank you for owning our film. Love. Team Dangal. The film was release on December 23, 2016 in India, it had the mid-week release in the overseas market. A sports drama film written and directed by Nitesh Tiwari. The story of this movie is so entertaining that's why its getting good word of mouth. Dangal 6th Day Collection occupancy is almost 60% and in working days the movie is doing a very good box office business. On Monday the movie had collected total Mon 25.48 cr and Tuesday it minted Mon 23.48 cr. #Dangal Fri 29.78 cr, Sat 34.82 cr, Sun 42.35 cr. Total: ₹ 106.95 cr [incl Tamil and Telugu]. India biz. FANTABULOUS! I Hope you liked my report on Dangal 6th Day Collection. Soon i will share more box office collection records by this movie. Keep visiting and do share this article with friends.